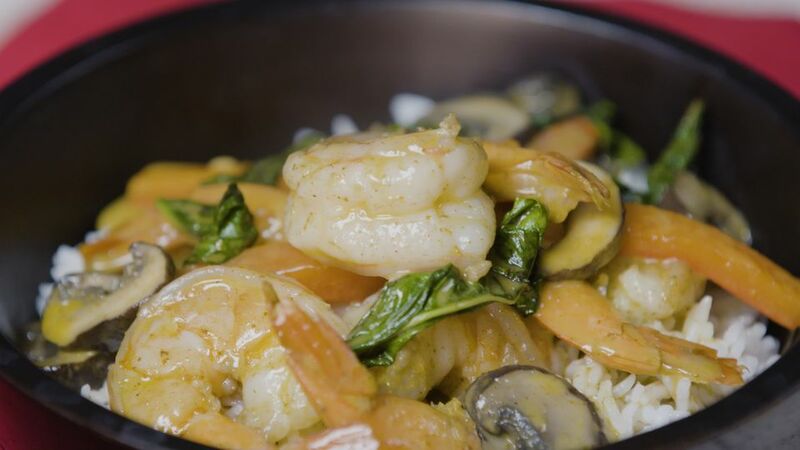 Bring warm Thai flavor to the table with this easy curry. Red curry paste forms the chile-forward backbone of this dish, cooked with coconut milk to give the sauce its yellowish hue. Carrots, bell pepper, mushrooms and basil add color and nutrition, while shrimp rounds things out with a crisp protein boost. Enjoy it over rice—and don’t be afraid to throw some sauce on top. Once hot, add in the cooking oil and red curry paste. Whisk for about 30 seconds. Pour in the coconut milk and continue whisking. Add in the mushrooms and the red peppers and continue cooking for 3 minutes. Add the shrimp to the curry and cook for another 2 minutes. Stir in the basil and serve over cooked rice.